Gale O’Brien is a cancer survivor, motivational speaker, wellness advocate, and the award-winning author of Transformation: Creating an Exceptional Life in the Face of Cancer, available in both English and Spanish. She is also a Certified Professional Life Coach who empowers others to pursue a passionate, exceptional life after a serious illness or profound life event. 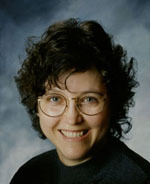 Visit Gale at GaleObrien.com. What is your elevator pitch for Transformation? 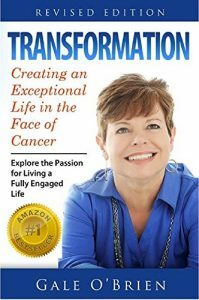 Transformation: Creating an Exceptional Life in the Face of Cancer is an honest, revealing, no holds barred description of my transformational journey to survival and how I finally gave myself permission to start living life fully engaged. Tell us what inspired you to write it. In talking with many cancer survivors, I discovered that some of them have no drive, ambition, or direction. They simply exist from one medical appointment to the next. They have allowed their cancer diagnosis to dominate their daily life and, in doing so, I believe they may be setting themselves up for reoccurrence. This is not an exceptional life to live. This is a doomed existence. I was inspired to write this book to encourage survivors to look outside the normal context of life and to create an openness toward what could lie ahead in their life after cancer. I wanted to encourage patients, survivors, caregivers and anyone encountering a serious illness to view disease as a phase to pass through with the hope of knowing that an exceptional life is waiting ahead. In planning the book, what was the first hurdle you came across? Deciding whether my book would be unique and necessary. I had to make sure that the book I was planning to write was not only unique compared to the other books on cancer recovery, but also necessary before adding one more title to the staggering number of books in print. What was the most rewarding aspect of writing Transformation? When I was writing the book, I was totally immersed and living it in my head. When my book was finally published, it felt like I was being let out of a cell, so to speak. I felt alive again! Writing a book is an achievement. The most rewarding part is the number of readers who have responded positively and thanked me for writing the book. Is there a book that has transformed your own life? What do you want to be known for as an author? Not just a purveyor of information and advice, no matter how useful those may be, but a writer. Someone who cares about, and crafts, words to bring people into the story; to take the reader on a journey. Personally, I want to be known for living my life in fearlessness. To have inspired a generation of cancer survivors to look beyond their diagnosis and to create an exceptional life afterwards. Which have you found to be the most challenging, writing or marketing? Marketing has been more of a challenge. Learning to overcome my fears that the book might bore people; that the book might not sell; that I might freeze during an author event and forget what I was going to say to the audience. People underestimate the amount of continuous marketing that must be done in order to turn one’s book into a blockbuster. As authors, we must shamelessly promote our book at every opportunity that presents itself. I’m currently writing an online course for cancer survivors available October 2015. Do you have advice for discouraged writers? Learn to reject rejection. Get used to the idea that there is going to be a lot of rejection along the way. The secret is to never give up. If one person tells you no, ask someone else. Someone, somewhere, sometime will say yes. Move on to the next person. Someone is waiting to say yes.